I graduated from Shippensburg University of Pennsylvania with my Bachelor's Degree in Elementary Education (K-6) in May 2009. Shortly after graduating with my bachelor's from Shippensburg University, I began working at an area NHS school that serves students with Autism as a classroom aide and substitute teacher. I am in my sixth school year of working with students with an autism spectrum disorder (ASD) diagnosis. While working for the NHS school, I started my Master's program in Special Education in May 2012 at Shippensburg University. While working, I took classes for my Master's in Special Education from the Summer of 2012 through May 2014. 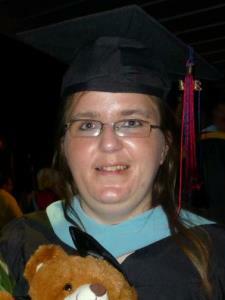 I graduated with my Master's in Special Education in May 2014. At this time, I added on my PA State Certification in Special Education (N-12); with my current PA Teaching Certification of Elementary (K-6). I am in the process of looking for a full-time teaching position with a school district or a private school. I am very ambitious to have my own classroom of students. I want to add experience of tutoring on my resume to gain more experience of working with students with and without disabilities at the elementary school level. I hope you choose me to be your son/daughter's tutor to help them succeed in school. Look forward to working with you and your son/daughter. I am qualified to tutor students in Elementary Education grades K-6th, because I completed my Master's in Special Education through Shippensburg University. I also passed the Praxis Exam to become certified to teach students with Special Needs. I received my teaching certification in Special Education (N-12) in 2013. I am also certified to teach in Pennsylvania Elementary education grades kindergarten through sixth grade. I am qualified to tutor students in Study skills, because I completed my Master's in Special Education through Shippensburg University. I also passed the Praxis Exam to become certified to teach student with Special Needs. I received my teaching certification in Special Education (N-12) in 2013. I am also certified to teach in Pennsylvania Elementary education grades kindergarten through sixth grade. I am qualified to tutor students with Autism because I completed my Master's in Special Education through Shippensburg University. I also passed the Praxis Exam to become certified to teach students with Special Needs. I received my teaching certification in Special Education (N-12) in 2013. I have 5.5 years of experience of working with students on the Autism Spectrum at an area NHS school. I am qualified to tutor students in Special Education, because I completed my Master's in Special Education through Shippensburg University. I also passed the Praxis Exam to become certified to teach students with Special Needs. I received my teaching certification in Special Education (N-12) in 2013. I am also certified to teach in Pennsylvania Elementary education grades kindergarten through sixth grade.